There are few people in the world with the intelligence and strength of character to pursue life as a philosopher. During more than a half century as a teacher, beginning at the International School of Geneva and then as a professor at the University of Geneva, Jeanne Hersch was known as a lively and vibrant talent who inspired and motivated her students in the pursuit of knowledge. As a student of Karl Jaspers, Hersch began translating his works from German into French. She was a prolific writer and essayist whose own contributions to philosophy focussed on human dignity and liberty, often in the context of larger social and political issues. Jeanne Hersch is highly respected for her dedication to human rights, serving as the first director of the philosophy division for Unesco. She later represented Switzerland on the Unesco executive council. During more than 20 years as a teacher at Ecolint, she enriched the lives of all who had the good fortune to know her. 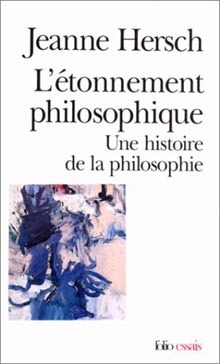 L'étonnement philosophique engages students in exploring the history of philosophy from ancient Greece to the present day. Individual chapters are devoted to each philosopher, introducing their ideas in a style that is clear and readily comprehensible. By making the study of philosophy come alive, Jeanne Hersch engages the reader to take the plunge into this fascinating field. Her excellent teaching skills are employed in emphasizing key moments in the development of philosophical ideas in a way that encourages the reader to delve directly into the original works of each philosopher. Hersch evokes the social climate and cultural environment that influenced the theories and ideas first put forth by each philosopher. Each chapter provides the foundation of knowledge necessary to understand the significance of each philosopher and introduces their writings with the aim of stimulating further reading. In taking up the original works of each philosopher, the student begins to fully appreciate their thoughts and ideas. Le Droit d'être un homme is a world-wide anthology of human liberty prepared under the direction of Jeanne Hersch for Unesco. This book is a tribute to the Universal Declaration of Human Rights adopted by the United Nations General Assembly in 1948. The fundamental qualities of human rights which are proclaimed in the Universal Declaration of Human Rights address the individual in society, the exercise of power, the limits of power, science, culture, servitude and violence, national identity, independence, and self-determination. Le Droit d'être un homme covers more than two millennia and spans all of the continents, inhabited during this period by the most diverse cultures. Published in 1968 to commemorate the Declaration's 20th anniversary, this important text illustrates the universal desire to affirm and to claim the birthright of man. Its publication was intended to give voice to those who have been silenced by the destructive critics of human rights. It is neither a scientific study, nor a moral treatise, nor a judgement of history. Le Droit d'être un homme was created as a means to promote the education of human liberty in a form that is at once spiritual as it is intellectual. This simple, yet ambitious theme is one which resonates throughout all time and amongst all cultures to achieve fundamental human rights. René Maheu, the Director General of Unesco, asked Jeanne Hersch to create a division of philosophy within that organization in 1966. In taking up this challenge, Jeanne Hersch was convinced that the long history of advancing human rights throughout the world should be brought to light, those human values that have been proclaimed, aspired to, and defended throughout human history. She believed that these same values that inspired the Universal Declaration of Human Rights should be remembered and become the cornerstone of international institutions, enabling us to withstand the pervasive threat of barbarism. Les gémissements ou les cris qu'on percevra dans ces pages n'émanent jamais des victimes les plus misérables. Celles-ci ont été, tout au long des âges, muettes. Là où les droits sont totalement foulés aux pieds règnent le silence et l'immobilité, qui ne laissent aucune trace dans l'histoire ; car l'histoire n'enregistre que les paroles et les gestes de ceux qui sont capables, si peu que ce soit, de s'approprier leur vie, ou du moins de le tenter. Il fut toujours – il est encore – des multitudes d'hommes et de femmes, d'enfants à qui on est parvenu, par la misère, la terreur ou le mensonge, à faire oublier leur dignité native, ou qui ont renoncé à l'effort de faire reconnaître cette dignité par autrui. Ceux-là se taisent. Les victimes qui se plaignent et qu'on entend jouissent déjà d'un sort meilleur. Jeanne Hersch is remembered as a lively and vibrant teacher whose exceptional academic career was respected for its thoroughness and clarity of thought. 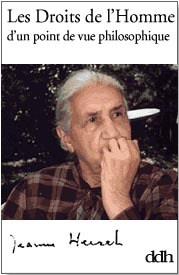 Her work is often quoted and a number of books and essays are devoted to her life. 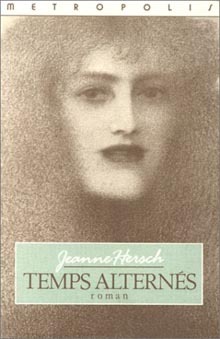 Jeanne Hersch : Présence dans le temps by Emmanuel Dufour Kowalski describes her life in the Age of Man. Born in Geneva in 1910 to a family of intellectuals, her father was a professor of demography and statistics at the University of Geneva and her mother was employed in the disarmament section of the League of Nations. 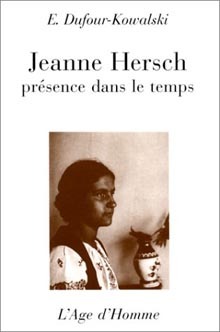 Jeanne Hersch studied philosophy in Geneva, Paris, and Heidelberg, where she studied under Karl Jaspers. She received her doctorate at Fribourg-en-Brisgau in 1946. As a teacher at the International School of Geneva from 1933 to 1956, Jeanne began translating the works of Karl Jaspers into French and published her first book on philosophy, L'Illusion philosophique. She was a professor of philosophy at the University of Geneva from 1956 to 1977 and also taught at a number of universities in the United States. Her work has been honored with many awards, notably the Prix Amiel and the Prix Adolphe Neuman d'esthétique et de morale. I was auditing courses in Sanskrit, literature, and philosophy, and hoping to study toward a degree in philosophy. Mlle. Jeanne Hersch, a brilliant teacher at the International School in Geneva, from which I had just graduated, had made this field come alive for me; while she taught textual analysis and French composition with passion and utmost rigor, she was also translating books by her teacher Karl Jaspers into French. I was struck by one of those books--an introduction to philosophy that had originated as a set of radio lectures for the general public. It seemed to speak directly to my questions about how to begin studies in this field. While captivating students with her lively and vibrant style, Jeanne Hersch also influenced a very broad audience. She was awarded the Prix Montaigne in 1979 for her service to the cause of liberty and for her contributions to intercultural communications. The work of Karl Jaspers was a guiding influence to Jeanne Hersch throughout her life. While her teacher at Heidleberg University during the early 1930's, Jaspers published his first major work on the history of philosophy. Qualified in law and medicine, Jaspers originally taught psychiatry, introducing many diagnostic criteria and clinical methods that have been widely adopted in current psychiatric treatments. Turning to philosophy, Jaspers held the chair of philosophy at Heidelberg University until 1937 when he was banned from teaching by the Nazi authorities because his wife was Jewish. Jaspers refused to make any concessions to the Third Reich. Upon resuming his teaching post after the war he published The Question of German Guilt, which examines the culpability of the entire German nation for the atrocities committed by its government. La culpabilité allemande was translated by Jeanne Hersch into French, together with other works by Karl Jaspers. 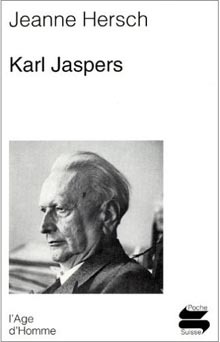 As a philosopher, Jaspers is often identified as an originator of existentialism. Drawing in part upon the existentialist roots expressed by Nietzsche and Kierkegaard, his themes of individual freedom and transcendence have had a significant influence on contemporary philosophical thought. Temps alternés is a romantic fiction novel set in wartime Europe. As the continent became engulfed by war in 1940, a young woman sits quietly at home on the shores of Lac Leman writing letters to her husband who has been mobilised to the frontier. She writes to him about past loves and of her adolescent years. In weaving this tale of young love, Hersch swam against the current of the time, when all hope seemed lost in the face of Hitler's conquests. The reader will not find any philosophical thoughts in this young woman's letters. On the contrary, she seems to have abandoned the maelstrom only to find herself absorbed in her dreams. Her thoughts are those of branches bending beneath the winter snow, of a pretty red bonnet, of juicy green apples and of grapes in a bowl. She perceives everything, yet knows nothing. With poetic attention to these details, Jeanne Hersch pays witness to the unity of life with all of its variations and contradictions. A magical feat that can be appreciated through the eyes of an adolescent. If a unity of life exists at all for this young woman absorbed in her dreams, then the unity that she attempts to weave exists solely in the never ending abundance of the present.